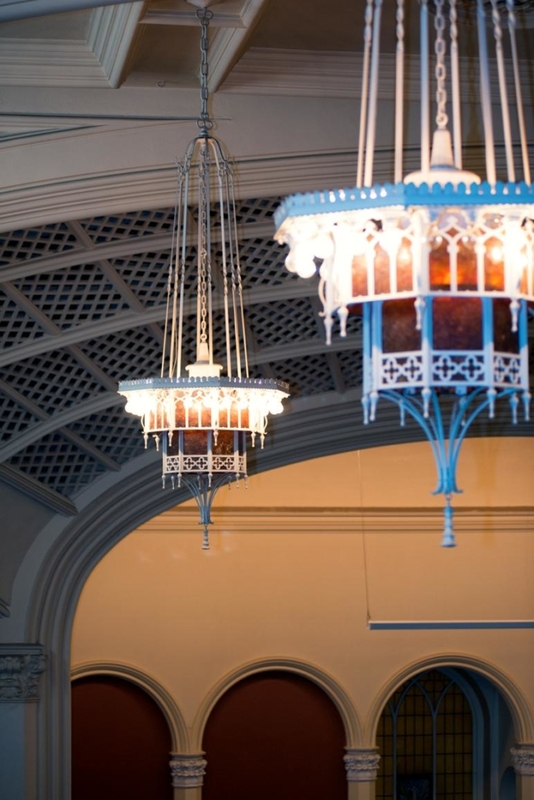 WEEKLY GATHERINGS: Sunday, 10:30 a.m.
At Urban Grace, we value the time we spend together on Sunday mornings and hope it is a meaningful time for everyone that attends. As an ecumenical congregation, we follow the liturgical, or Church, calendar which roots us in ancient Christian tradition and connects us to the larger body of Christ. We hope these rhythms and seasons deepen our spiritual practices as we remember together God’s promises and the story of our reconciliation to God and one another. Every Sunday is unique including the worship band, preacher and themes, so you’ll need to visit a few times before you can get a realistic picture of who we are. Whether you like traditional hymns with organ, gospel music or bluegrass, there is something for everyone when it comes to our musical styles. We often incorporate poetry, dance or art pieces into our worship services as well. All are welcome! Children are welcome in our services anytime. We love the sounds of babies and inquisitive kids throughout the morning! But if you’d prefer, we also offer quality nursery and Sunday School programs during the service. We start all together in the sanctuary, then kids will be dismissed after the Blessing of the Children. We offer nursery care by trained staff and volunteers for those three years old and under. Our classes for kids, including a new creative hands-on preschool class for those graduating from the nursery, take place during our worship service and follow a lectionary-based rotational model following the liturgical (or Church) calendar. Each week they focus on a story that corresponds with the church season and look at that story from different angles through activities like games, songs, drama, crafts and other hands-on projects. The first Sunday of the month is our congregation’s communion Sunday, so our Sunday School class is shortened so children can be a part of this meaningful time with our church family. Our youth group (5th grade – high schoolers) is on Sunday afternoons at Urban Grace. We join with about seven churches in the area in order to provide a robust group for small churches that would normally not be able to provide a program. With our large age range, we break up into age-appropriate groups for discussion and some activities. Pizza, games, discussions about faith, and laughter are provided each week. We take the safety of our children seriously and hope that all families feel secure in the policies and procedures that have been set up to ensure their child’s well-being. Please take a look at the policies we have and let us know if you have any questions. On Sundays, Urban Grace offers two Sunday School classes for students ages 4-7 years and 8+ years as well as a nursery for children 3 and under. With years of ministry experience, Sheila oversees these classrooms as well as our other youth and children’s programs with great enthusiasm and a love for helping children explore faith in new ways. If you know me at all, you already know the most important things about me…I like your kids. I like getting to know them, talking about God, the bible and the church with them, making stuff with them, answering their questions, playing games and having adventures with them, and just generally goofing off with them. What you may not know is the deep conviction that lies behind all that. Some of the last words that Jesus spoke when he was on earth were to Peter when he told him to “feed my lambs, take care of my sheep”. This instruction…or, as I like to think of it, this invitation is what compels me to invest my time and energy with your kids, and with you. While I have been at this a few decades, I am always learning new ways to feed and care for God’s lambs. I am most eager to partner with you in this ongoing discovery. I am open to any ideas, questions or concerns that you may have and trust that together, by the grace and mercy of God, we can fully embrace this joyful task. Nursery & Sunday School Sundays, 10:30 A.M. Throughout the year we offer topical small groups based on interest and/or liturgical season (i.e. Lent, Advent). Topics have included science & faith, race, and the work of James Alison. This long-running, Bible study on Wednesday nights takes an in-depth look at different books of the Bible. Dinner starts at 6pm and everyone brings a dish to share. The bible study starts at 6:30pm. Everyone is invited to both or either part of the night. Enter at the 9th Street door and join this group in the Parlor. This group meets for breakfast and a discussion of the lectionary texts on Thursdays at 7am. The diversity of voices and long held friendships make for a very lively and fascinating conversation. Enter at the 9th Street door and join this group in the Parlor. 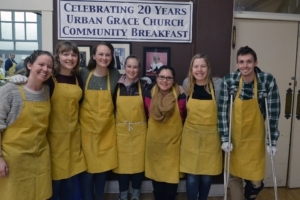 Our Congregational Care Team gets together regularly to help meet the immediate needs of those in the church and help integrate new congregants into the life of Urban Grace. Whether you or someone you know needs hospital visitation, prayer, meals, community resources, or the schedule of social events, the Congregational Care Team can help get you connected. 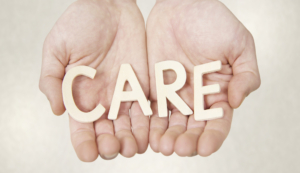 Contact our Minister of Spiritual Care, Lesley, about care needs. We place particular significance on the poor, marginalized, and oppressed and seek to reach out through providing services that meet immediate needs as well as supporting, collaborating, and developing efforts to strive for justice and equity for all who live in our city. This weekly breakfast is a unique way to meet those in need in the community. Every Sunday over 200 people are served a free, hot breakfast and are always looking for a listening ear and friendly face. Come join us! Contact Willie to volunteer or for more info. On the second Sunday of every month, volunteers with the UW MedEx physician assistant program come to the Community Breakfast to provide free foot care and health screenings to anyone who needs it. They serve about 15-25 people per month, and provide valuable one-on-one time with the attendees of our breakfast. Read article about the foot care clinic from MedEx Magazine. Read article and see video about foot care clinic from Tacoma News Tribune. NEW MedEx Foot Care Clinic Video! Through this annual event, Urban Grace provides a safe and fun place for families to celebrate Halloween. This party is not just for families within our own congregation and neighborhood, but also reaches out to other churches partnering on our joint youth group as well as those at Tacoma Rescue Mission. For more information or to volunteer, contact the church office. Downtown Mural Sponsored by Urban Grace and the City of Tacoma’s Innovative Grant in 2009. Design and Artwork by Fab-5. We value the arts as a unique and strategic part of our community context and as a means for exploring, expressing, and communicating truth and beauty about God and one another. We encourage creativity and freedom of expression in our worship and practices. We also seek to develop and nurture the arts and artists through the use of our facility as a community arts center.